The computer is designed to meet the command- and data-handling requirements for missions requiring space-grade radiation hardness and fault tolerance, but in a much smaller size, lower weight, and lower power than what is currently available. The invention leverages the Lab’s legacy of designing instruments for satellites and deep space missions for over fifty years. Read more (link to article). Learn more in the current issue. 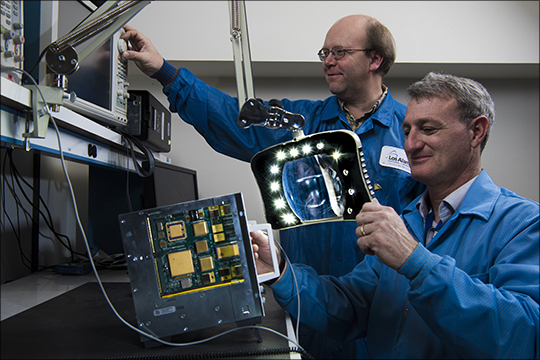 Photo caption: Paul Graham (left) and Robert Merl work on the Radiation Hardened Single Board Computer for Command and Data Handling. Read these articles and more in the Sept. 26, 2018 issue. Science Highlights features some of the current, cutting-edge scientific research at Los Alamos. The highlights also include recent awards and recognitions of Los Alamos scientists. Science Highlights is published once a month and produced by the Laboratory's Science, Technology, and Engineering directorate.